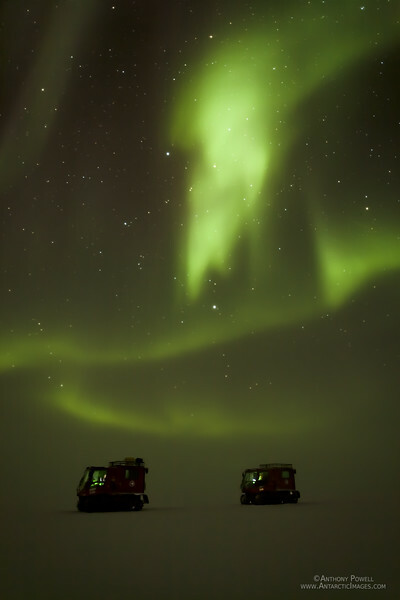 Two Pisten Bully vehicles traversing across the Ice Shelf from Black Island back to McMurdo in foggy conditions with an aurora overhead turning the lighting green. Temperatures were approx -55 C out on the ice shelf this day, so I only managed one or two photos before the camera froze. How amazing. How fortunate you are to even have gotten two photos before your camera froze over. it's still awesome! great shot! Amazing image. What awful conditions, but the light is something else. Thank you so much for sharing with us something most will never get to see. Breathtaking! This is so eerily beautiful! Like a painting of the mighty creator himself! I'm lucky that your camera didn't freeze before you managed to capture this enticing image!